Parrot Forum • View topic - Friendly bird sometimes divebombs and bites? I have a 2or 3 year old senegal parrot. I think he's a boy (based on what vets and others have told me) but not at all sure. He is flighted and seems to take great joy in swooping around the house, which I love. He normally lands on my hand and asks for attetion or cuddles. But in the mornings he has started flying to my hand and attacking it viciously. I try not to react (as in not shake him off into the bin like the little turd he's being) and calmly take him to his cage (while receiving several nasty bites). I know there must be something I'm doing wrong, but I just can't figure it out. He is very hand tame, and generally a real pal most of the time. This is typically a morning thing, he rarely bites otherwise (sometimes when we put him in his cage, but this is something we've sarted to solve through training). I've had him for about 2 years. he's sweet to my boyfriend too, and he rarely gets bit (though this could be partly because he's around him less in the morning). I do most of the training. I don't want to clip him, but having a winged velociraptor timebomb is a little stressful. Re: Friendly bird sometimes divebombs and bites? you have had him long enough to be able to respond to a bite with ouch. they need to know when it hurts you at this point. because she is flighted I also just flip myrtle off me. I stay silent only with a bird that is using bites to control me. if it believes it has the power it will always bite. it is easier to brake a flighted bird of biting because it will learn it will be flipped off when it bites. it is harder to trane my aunt betty than the bird. she screams when dive bombed and myrtle has turned it into a way to amuse herself. that is like when Rambo used to hide behind the toilet and jump out at her to make her scream. aunt b will scream if I poke her with one finger. There is no problem with visually sexing a Senegal as their are visual differences between the male and female of the species, so if the vet said that it is a male, then it probably is. you could post some pictures of him showing specifically the " vest" and its shape and positioning on the bird the point of he vest is in a different place on the two sexes. More specifically the vest is longer in the female than in the male with the point of the vest being positioned closer to between the legs while the same point on the male is more often about mid body or even around the level of the birds chest. Given the birds age it is very possible that he is hormonal and perhaps going through puberty which changes many things about them including their personalities as they will no longer think like a baby bird it will think and respond as an adult bird from now on if this is what is occurring. Does it seem that he has changed who his favorite person is? I ask because the dive bombing tactic usually comes into play when they are trying to prevent one party from spending time with their chosen person, so this is them trying to drive others away from their favored human. This tactic is often used if you are hanging around too close to their cage as the cage is the same as their nesting area and they will protect and defend their nesting area from intruders. This same tactic is used to drive away someone that they really don't like, but this does not sound to me that this is the case. We should look at the birds diet as the amount of protein may increase and decrease both hormone levels as well as aggression in the bird. Exercise can also help in reducing both aggression and hormone levels in the blood and the best form of exercise is flight. Because of this alone I would not clip his wings, there are many other reasons why I would not clip a birds wings that have to do with the birds mental, physical and emotional well being. You could get a new stuffed toy, a small one that you could carry with you and hold it up when he tries to dive bomb you. This would be a form of distraction. As far as him landing or stepping up and attacking your hand, this could be aggression due to diet and/ or hormones or even that he woke up in a lousy mood. I do not ignore it when any of my birds bite me. I don't make a huge drama thing about it but I am not above yelling ouch or something similar and then sitting the bird down on the closest available surface and ignoring them for a few minutes. The more information that you can give us on the circumstances leading up to the biting and the dive bombing the more accurate our answers and suggestions will be. thank you very much for your reply, this does help me open some new avenues to try and solve this issue. I do think that Buddy (the bird) is getting more attached to my boyfriend, so this could be it i guess? But the bites only ever occur when i am alone with him, and my boyfriend also sometimes gets bitten in similar circumstances.. so I don't know what to make of that. often, Buddy will land on my hand, bite (draw blood) and then start flying around the room, and swooping me; I don't think this is a way to amuse himself because he gets all pinpointy eyed and hissy. I've been trying to distract him with training when he gets like this, to get him back into cooperation so that I can put him in his cage. this mostly works. I've had to get him in the cage wrapped in a towel once though. When he's in this crazy mood he will try to attack me though the bars too. He is also very teritorial with his cage; i can not change the food bowls when he is in there, have to do it when he is in another room. This is really a morning problem. the rest of the day, he tends to be gentle. 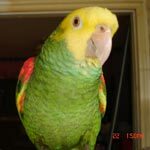 I'm meeting a lady from our local parot rescue soon, and hoping that she can help me with this. This sounds to me to be both territorial and hormonal in nature, not too surprising as they often go hand in hand together. And his age is also about right for him to be going into puberty. A low protein diet combined with a solar light schedule with full exposure to the two twilight periods of dawn and dusk is the only long term method that I am aware of to control hormonal issues with ones birds. The position of this birds cage in relation to the activity in the home may have something to do with the dive bombing type behavior as that sounds more like how he would act in trying to defend his nesting area. Brussels is almost 51 degrees north. Wolf, is this too far north to attempt a solar schedule? The bird may not get enough light at this time of year, and won't get enough sleep in the summer. I don't know where the cutoff for attempting a solar schedule would be. I know you couldn't do it in Saint Perersburg, for example, but I don't know where the cutoff would be. It is hard to towel a flighted bird. I have a butterfly net. Only used it twice when a cockatiel got behind or under something and would not come out. It is big enough that it could be used on an amazon in dire emergency. Glad you caught that, Navre, thank you so very much. I am not sure where the cut off point would be but it is something that we should have some idea about, at least a working cut off point. So then I reckon that I would need to know how many hours of daylight that the OP has now and how much daylight do they expect on Dec. 21st. Boston is at about the same latitude as Rome. Anything north of Rome in Europe and it's something I think we have to consider. I remember my grandparents talking about how long the days were during Irish summers, and when I had one kid in St Petersburg and the other in Narva Estonia last summer, they said it didn't ever get dark at all.